“Motorbikes with sidecars are my passion” remarks Claude, just as well really as I’m very snugly inside one as we bounce across the muddy tracks that crisscross the Hoi An countryside. 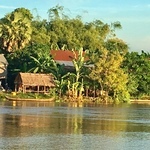 This is an experience well and truly off your typical tourist treadmill as we trundle along by the side of rice fields and shrimp farms, negotiating the odd water buffalo and a few errant hens. 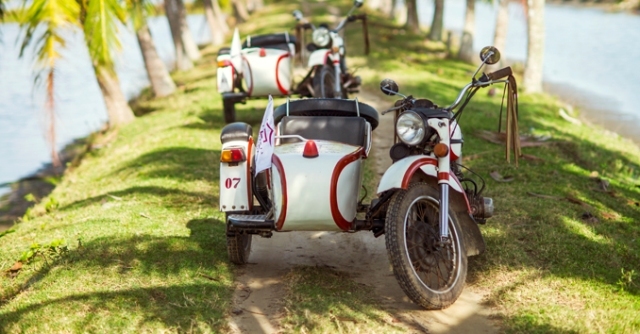 Claude is the General Manager of the luxury Victoria Hoi An Beach Resort and Spa but doubles up as an unusual biker tour guide for hotel guests who want to a peak at daily local life in Vietnam’s central region. 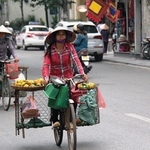 Hoi An, just a half hour drive from De Nang city in Vietnam’s central region, is a delightfully historic town which, because of its remarkable escape from any conflict damage contains a wonderful array of old town architecture dating back hundreds of years. Ancient Japanese merchant houses and Chinese temples hold hands along narrow streets leading down to the Thu Bon River, where in its heyday, Hoi An was a thriving port town. These days, the lovely merchants houses are trading tourist traffic, the tea chests long gone in place of tailor shops, trinkets, restaurants and bars, but the market is still buzzing with local life and after dark, the old town still has a charm about it which is well worth experiencing. 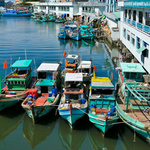 You could even take a junk river cruise directly back to the hotel’s own dock after you’ve enjoyed a bout of haggling of course. 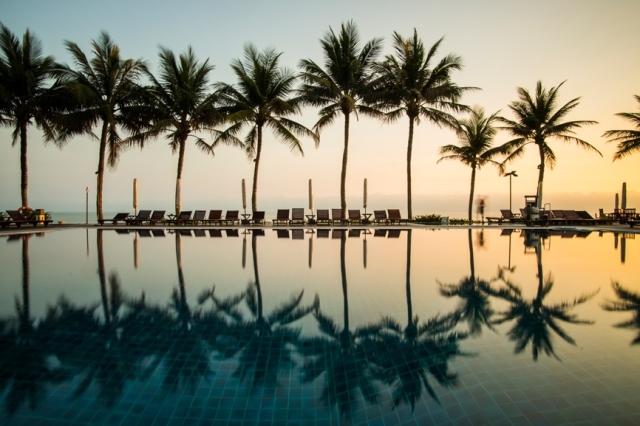 Victoria Hoi An Beach Resort and Spa is perched on a thin strip of land between the Thu Bon River and its own private sea front just 5k from Hoi An, far enough for perfect beach side peace and quiet, yet near enough to easily pop into town using the regular free shuttles. Then again, you can always grab a bike at the hotel and in just 15 minutes, pedal in yourself like a local. 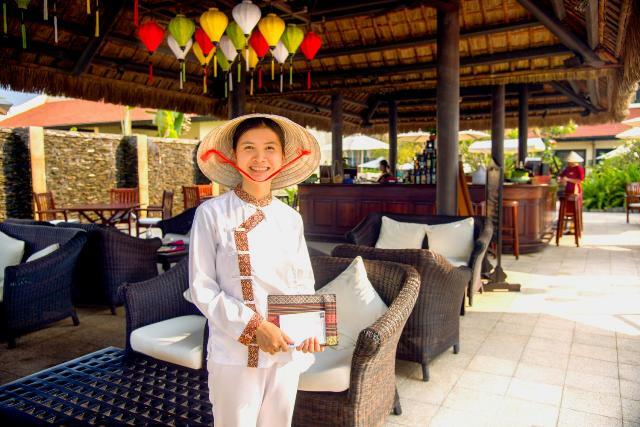 And just like its UNESCO neighbour, (although a great deal younger), the resort is faithful to a traditional Vietnamese village, with clay tiled roofs and bubbling ponds and streams and some colonial architecture thrown in, but that’s where the similarity ends for this is a truly exceptional property. 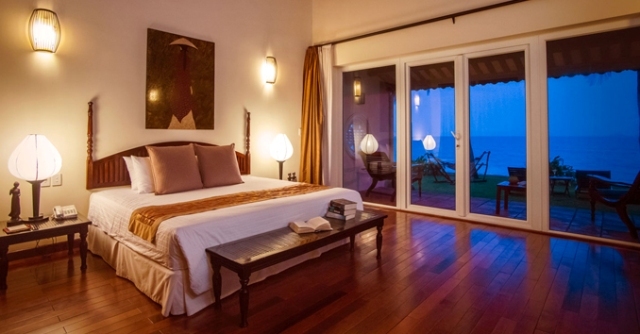 The 109 guestrooms are essentially spacious luxury villas with private decks furnished in Vietnamese, French colonial or Japanese themed elements with views facing the river, the gardens or my particular favourite, junior suites right along the sea front. These rooms are literally within touching distance of the water, the sound of the surf a wonderful way to fall asleep each night. 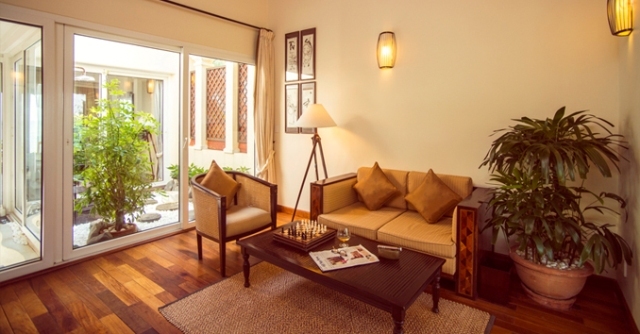 My suite features an internal courtyard with a decadent outdoor shower as well as an indoor bathroom, Japanese furniture and a spacious lounge bedroom leading out to the sea facing deck. The bed takes up an impressive space, but there is more than enough room for a supporting cast of flat screen TV, fresh coffee and tea, DVD player and a very comfortable couch. 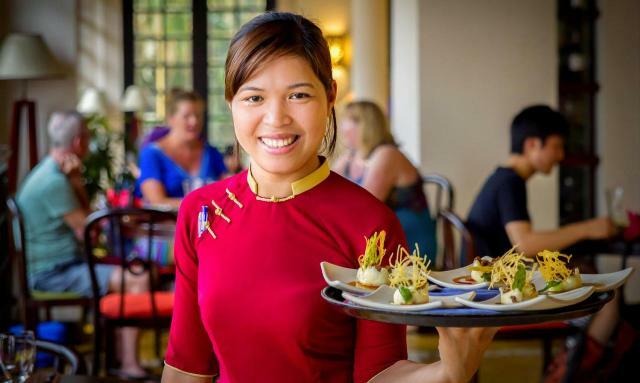 Taking the short walk around the infinity pool to the restaurant I find a buffet fit for an emperor; everything from freshly baked pastries and fresh fruits to western hot food and of course a pho chef to prepare Vietnam’s most contagious breakfast dish. I am not ashamed to say I have fallen head over heels in love with pho, the steaming bowl of broth and rice noodles into which are thrown bales of fresh coriander, mint and bean shoots has become an obsession. After Claude safely delivers me back with his sidecar intact, I spend a grateful hour before dinner on the hotel’s private beach. Just me, a lounger and the South China Sea. Talking of dinner, the restaurant offers an excellent regular buffet of Vietnamese and western dishes including a mountain of barbecued choices, but the lunch fare on Sundays is legendary. Just VND 500,000 (around £15) gets you an all you can eat buffet including bubbly wine, beer and soft drinks. 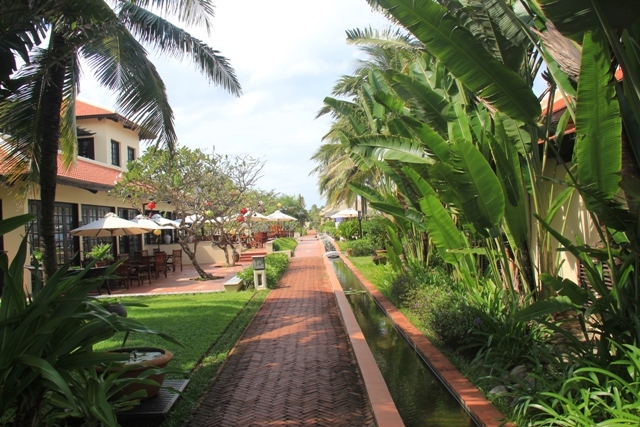 There are many resort options around Hoi An but be aware a lot of them will be river fronted. 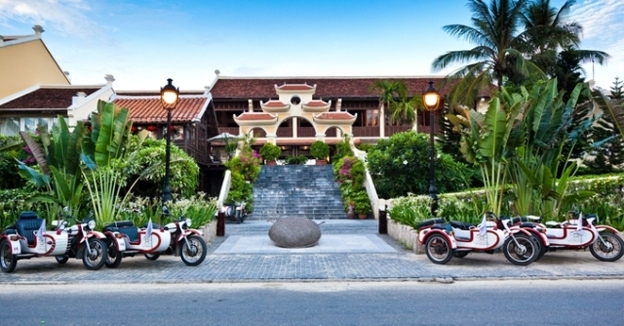 Victoria Hoi an Resort and Spa, as one of the first resorts in the area had first pick, hence its stunning sea front location. Of course Claude will tell you, no stay would be worthwhile without a side car trip with him on his motorbike. And you know what? He’s absolutely right. Junior Suite sea front double including buffet breakfast from $250 per night.